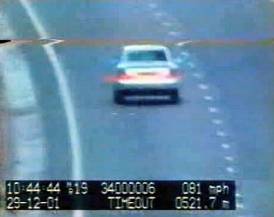 We have reproduced two pairs of frames recorded by a LTi 20/20, but which vehicle is travelling at 97 mph and which at 81 mph? 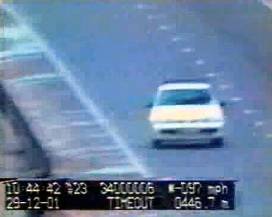 If you would like to view the complete traffic video you should follow the link to this page. 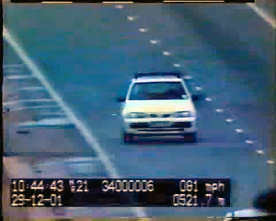 The answer to this question is very important because one driver is liable to prosecution and the other is not! This is the same speed reading but it has timed-out, so it is too long since the measurement was taken. 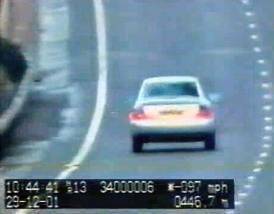 This recorded speed is above the pre-set threshold and the offending vehicle is travelling away from the laser gun, as denoted by the "-" sign. This is the same speed reading, however the device has timed-out, which indicates that this frame can not be used as evidence. You may wish to view the video in real time (1.3 Mb download).